Dr. Joel Roberts Poinsett, an amateur botanist and first United States ambassador to Mexico, introduced the plant that became known as the poinsettia to the United States in 1828. A native of southern Mexico, the poinsettia blooms in December and has been used in that country to decorate churches for centuries. Many consider the red color a symbol of purity, and so poinsettias were traditionally part of religious ceremonies. 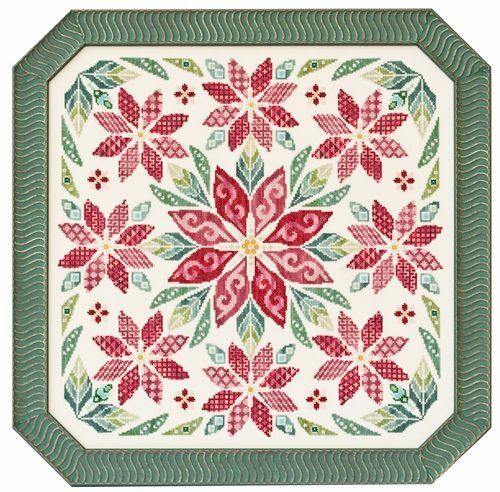 Many also believe that the shape of the poinsettia flowers and the leaves are a symbol of the Star of Bethlehem which led the Wise Men to Jesus. In Mexico and Guatemala, the poinsettia is called “Flores de Noche Buena”, which translates to “Flower of the Holy Night” (referring to Christmas Eve). Fabric: Stitched on 28ct Antique White Jobelan provided by Wichelt Imports, Inc. Suggest purchasing a fat third (24″ X 27″). Glendon Place does offer this fabric on the website. Materials Summary: Uses 9 colors of Dinky Dyes hand-dyed silk floss, 7 colors of Mill Hill Beads, and 2 types of Mill Hill Glass Treasures and 1 color of Sullivans/DMC/or Anchor floss. Comparable Sullivans/DMC/or Anchor colors are t provided for this design.